A Moment In Time. A Stroke of The Master’s Hand. An emerging visual arts master is earning so much acclaim nowadays for his works that show not just his artistic talents but also his creativity in presenting his view of the things, issues, events, and people around him. I’m talking about Phil Hansen, recently featured in Yahoo!’s People of the Web for his remarkable works as a painter. His most recent circular painting, for me is the “juiciest” in terms of creativity in concept, insight, execution, and impact. Hansen started this work which he entitled “A Moment” by posting his number on the Web and asking people all over the world to send him by fax or email about a moment, a personal experience which they consider unforgettable or which has caused a great impact or change in their lives. For the next month or so, people started emailing, faxing, calling Phil, sending him their personal stories of memorable moments in their lives. Some shared moments of success, happiness, triumph, achievement and joy. While others shared moments of grief, trials, failure, desperation and hopelessness. When over 600 moments have been compiled by the artist, he started giving form to his painting. The canvas is a huge six-foot circle which was attached to an axle like a wheel. The artist began painting by actually writing the people’s experiences onto the canvass starting at the center. 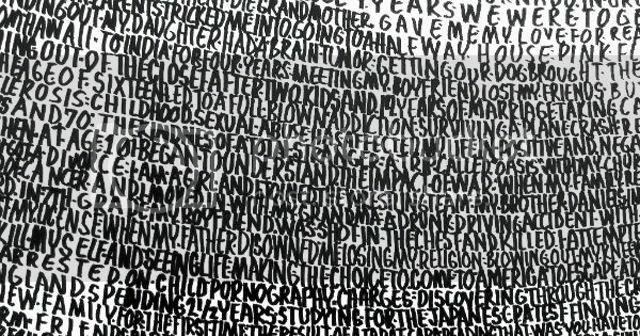 The letters of each sentence were used as shading to give volume to the image Phil Hansen was trying to create. He spiraled outward spinning the canvas, carefully and faithfully scribbling every single story from the 600 correspondents. When the painting was done, one could clearly see the image that was formed: a face with five hands caressing it. 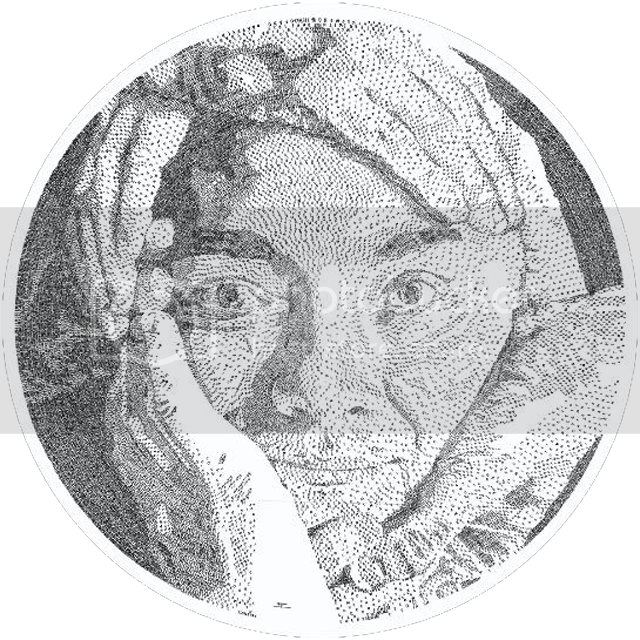 From a distance, it looks like an ordinary black and white pointillist painting, but up close, the letters, the writings, reveal the stories, the moments in the people’s lives. “Amazing!”, I exclaimed as I scrolled down the webpage. “This guy does it so artistically, so creatively with so clever an insight on how to create a painting that’s not only impressive in terms of technique but also on how it affects one’s thoughts and emotions.” Amazing how an artist can collect these people’s personal experiences and turn them into a thing of beauty. But what’s more amazing is how God knows all our experiences and uses them to make something beautiful. He is the Master Artist! He is the one who designed and created us, He is also the one who designs and creates situations which we experience day by day. God knows each and every single thing that happens in our lives and He knows how these experiences will affect us. He allows us to experience good things so that He can make us rejoice in His goodness and faithfulness. He allows us to experience bad things as well, because He wants us to trust in Him more and be confident that His grace is ever sufficient. Moreover, He allows us to experience challenges and struggles so that we can seek His wisdom, His purpose, His will. God knows how all these experiences can help build up our character, our faith, our very lives. He is the Master Artist. Not only does He know every moment in our lives, but also every detail of our being, every thought, every dream, every tear, every hardship, every triumph, every beat of our heart. Even before we were born, God knew us. And everyday, every hour, every minute, He sees us, He knows us. And He is the one who calls us to be His children. By being His, we know that He will continually use our experiences to transform us into something beautiful, into the image of Jesus. Isn’t it a comfort, a warm assurance that the Master’s Hand is at work in every moment of our lives? So trust in the Master. Look forward to the moment when we’ll know that indeed it is the image of Christ that is seen in us!